The land is checkerboarded, meaning that some of it is privately owned, some of it is owned by the state of New Mexico, and that some is federal land administered by the Bureau of Land Management (BLM). With the aid of a good map, a person can follow some of the 4-wheel-drive-only tracks on the BLM land. 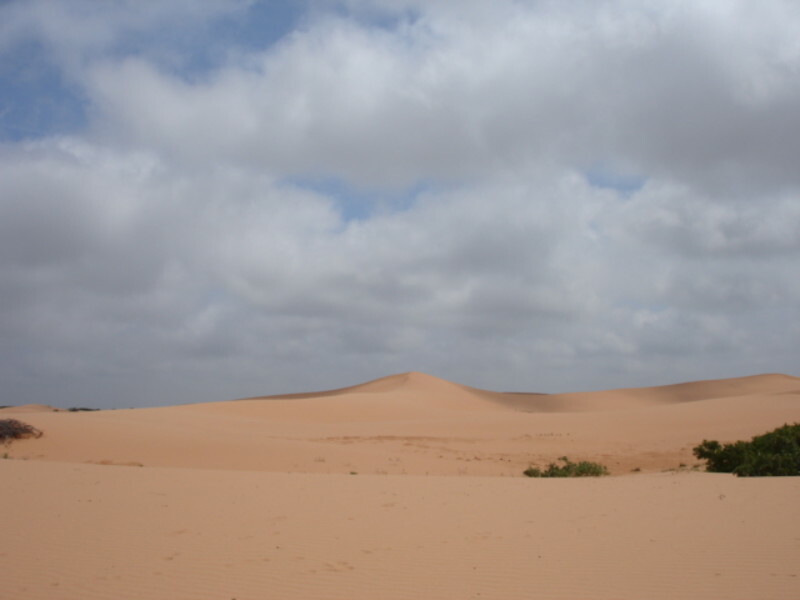 There are almost no houses in the region, so if a motorist gets stuck in the sand, they should climb the tallest dune and pray that a cell phone works. 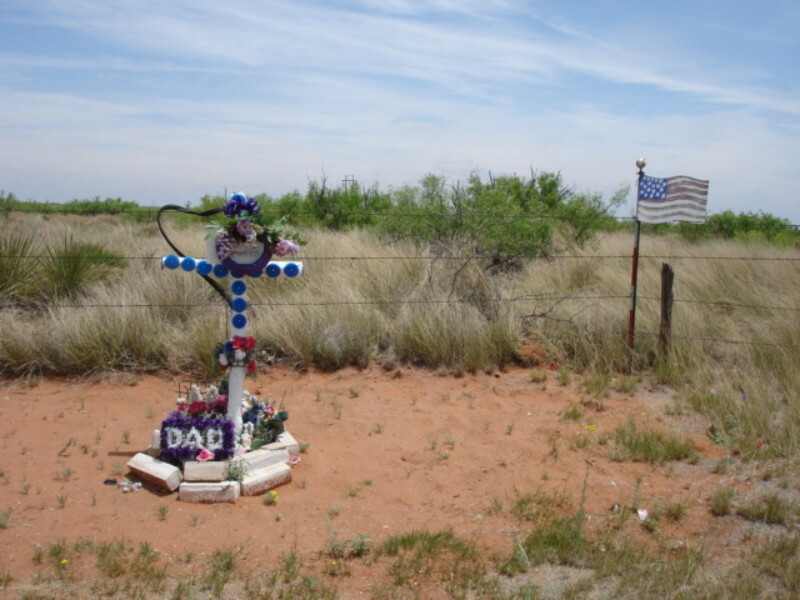 It is very tough country – heat and rattlesnakes can kill a blithely ignorant individual! 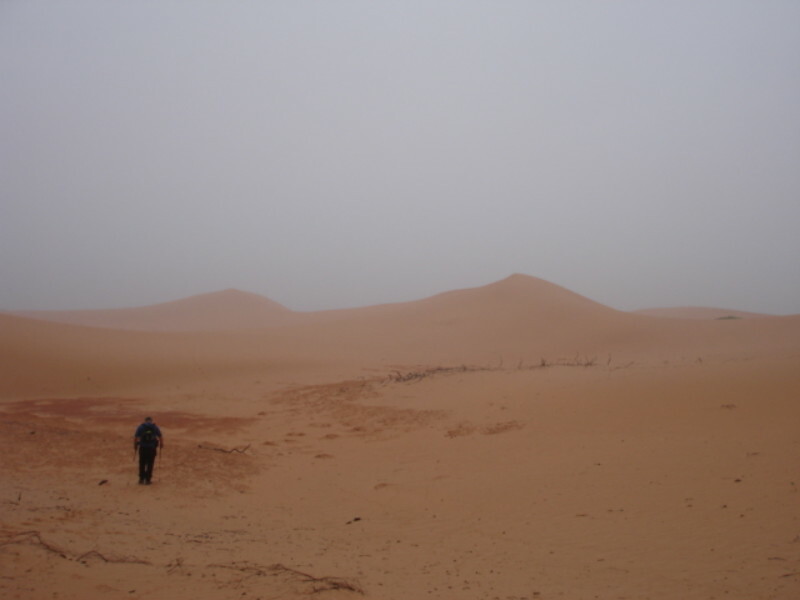 On an unusual foggy morning, a hiker might get turned around and lost in the "featureless" dunes. For inexperienced hikers it is best to take a GPS device and record a waymark for where the vehicle has been left. In between the dunes are "blowouts." In a blowout the ground is as hard as cement Ð some of it is red in color, and other parts are white. Just above a blowout the reddish blades of sandbluestem show new bluegreen growth. Seedlings of cockleburs sprinkle the sand next to last year's plant. 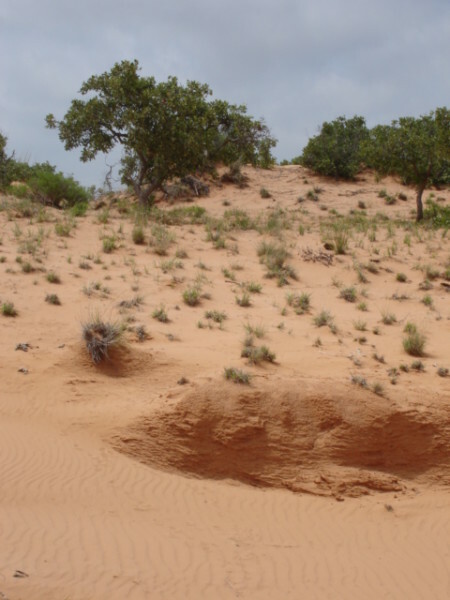 Out of the side of a sanddune, eroded hardpan formed ledges. An old root was the only evidence of a long dead shinoak. 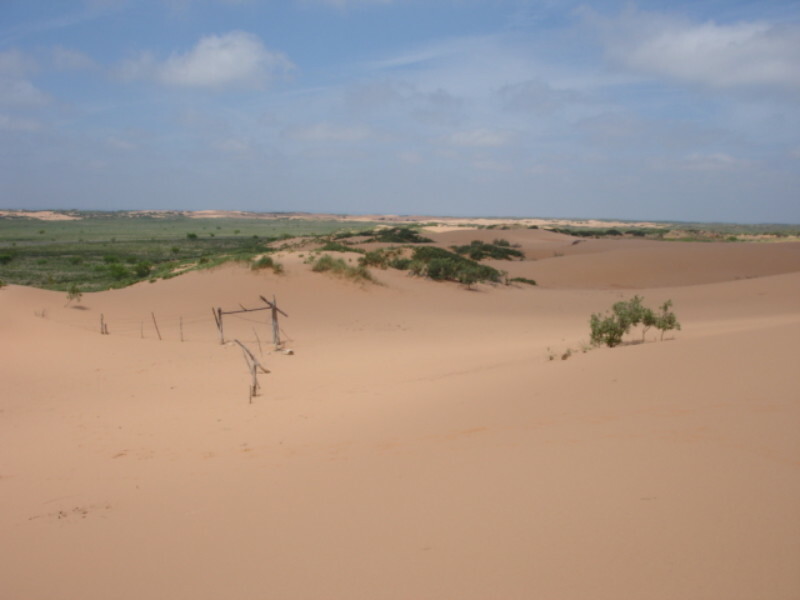 The open dune field is bordered by dunes covered with shinnery (Quercus havardii), also known as shinnery. 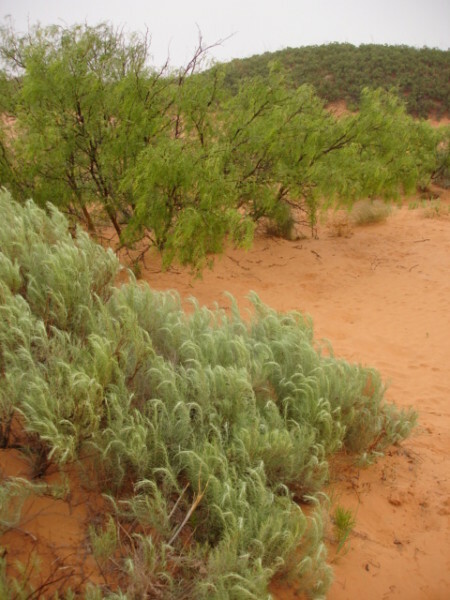 Among the dunes can be found the silvery sand sage and the bright green mesquite. 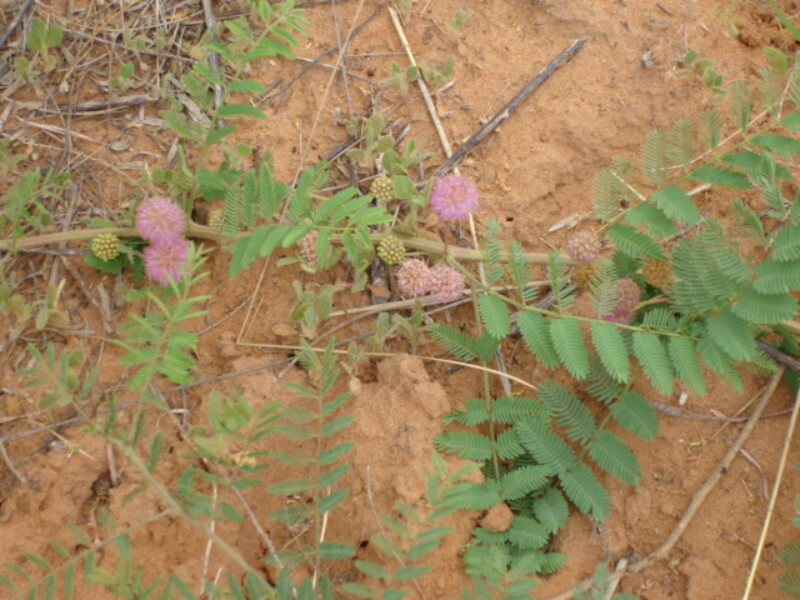 Sensitive briar crawls among the grasses and shrubs of the vegetated dunes. The compound leaf has the fascinating adaptation of folding up its leaflets when the leaf is disturbed by windblown sand or a grazing animal. 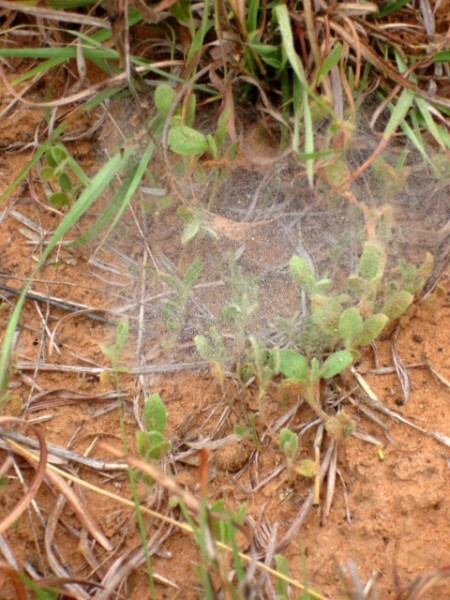 The web for a funnel web spider is a great way to trap passing grasshoppers. Immature grasshoppers and wingless species of grasshoppers travel by happenstance - not knowing where they will land. In the foreground the tall plant with yellow blossoms is known as Old Plainsman. 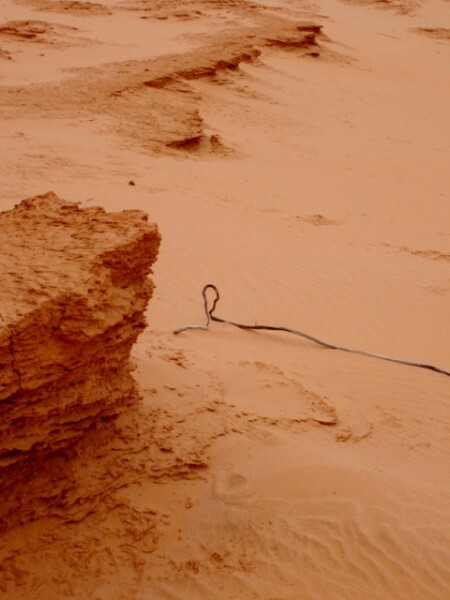 In the background is a huge old sanddune held together by one individual shinoak. 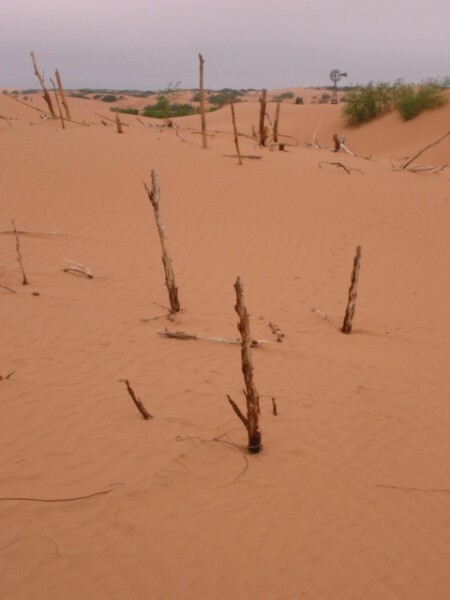 Mycorrhizial fungi probably cause the layering of the sand and its compression into a hard substrate. 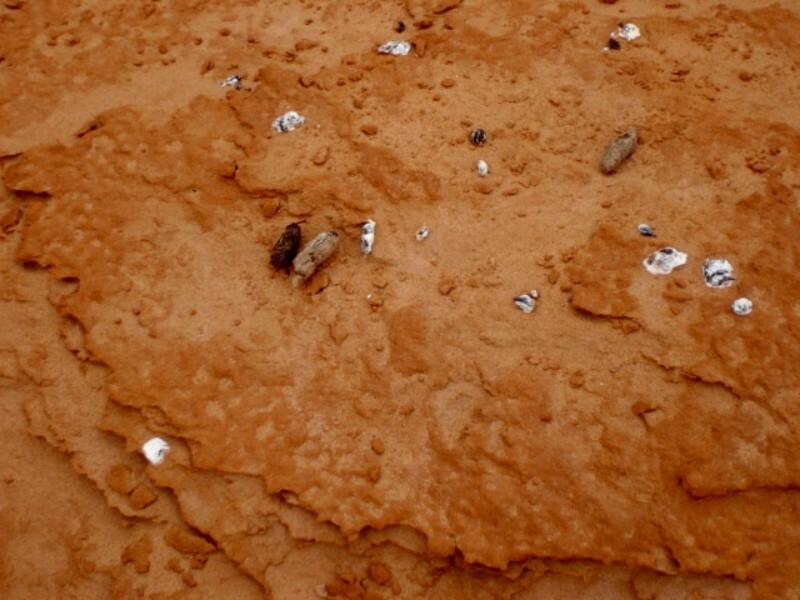 These fungi allow a shinoak to extract nutrients from an almost sterile sand dune. The moisture of the fog held together a line of faint footprints. Judging by the 18 inches between footprint, a turkey passed by. 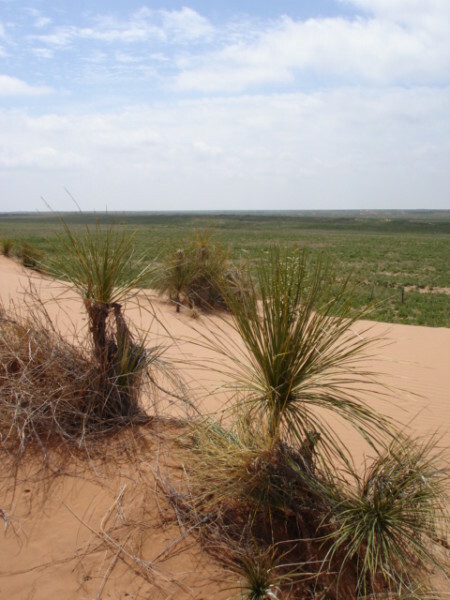 Sanddune habitats also have prairie chickens. 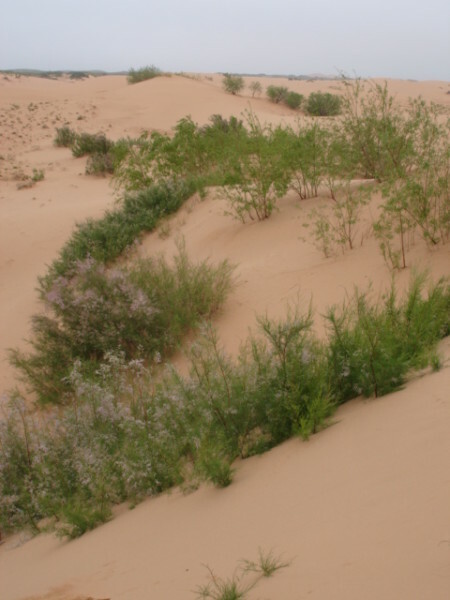 In a swale between the dunes were a dozen widely separated mesquites. Under just one of the mesquites was over 300 of these tiny holes. 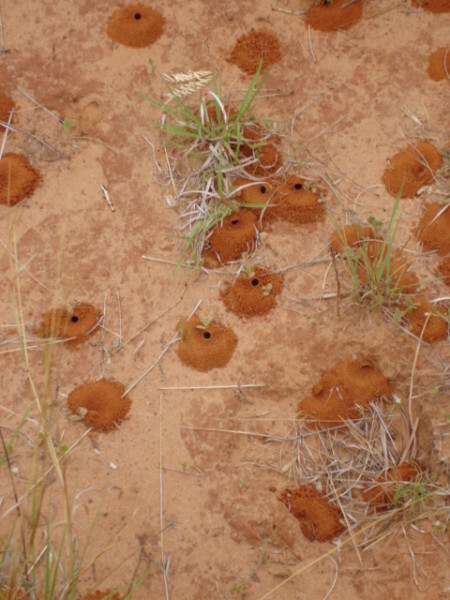 Several species of ground bees will nest colonially. Each female will dig a hole and lay a number of eggs, each separated by plant material and pollen for the hatchling bee. One of the most common rodents of the sanddunes are kangaroo rats. 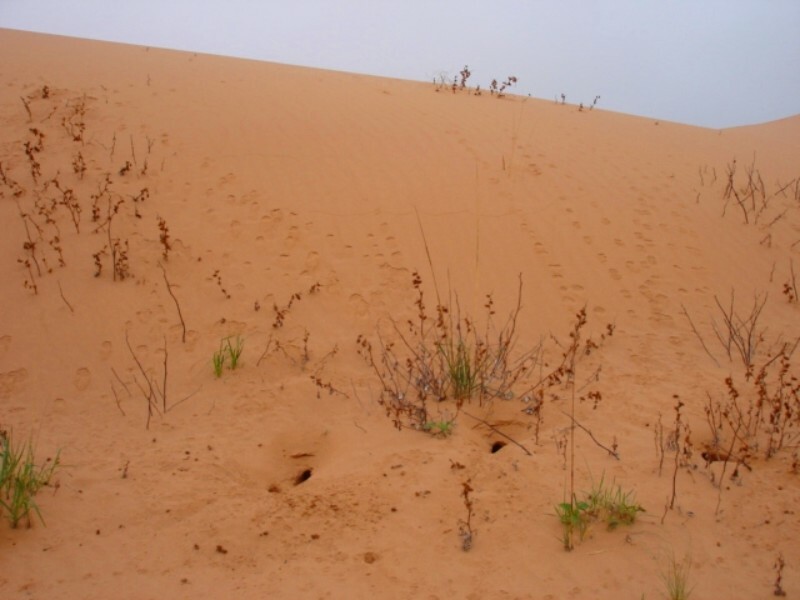 At daybreak, each dune will have at least one track of a kangaroo rat. 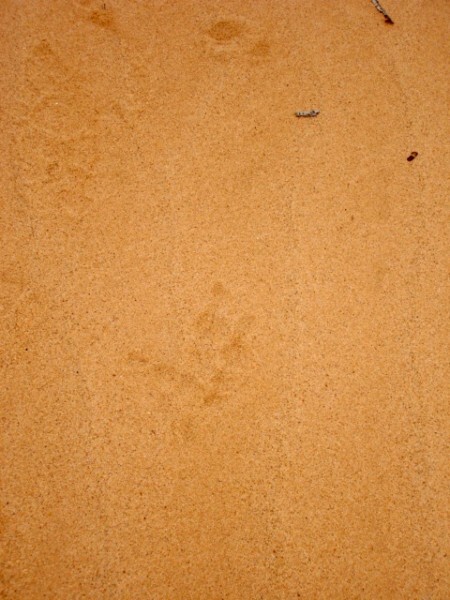 This kangaroo rat track leaves his hole, goes up a steep dune face, and then returns to its hole. 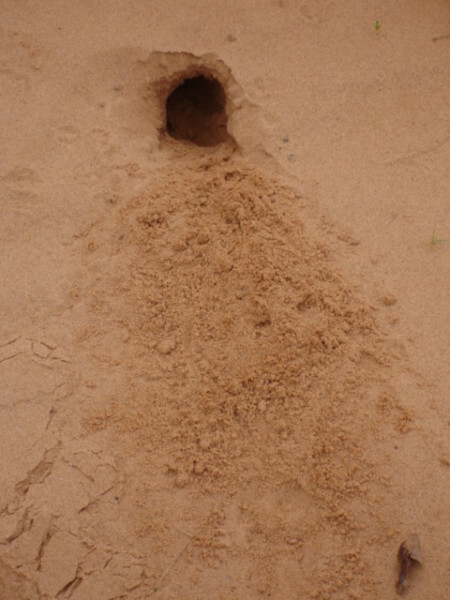 Were these three holes the work of one kangaroo rat, or three? 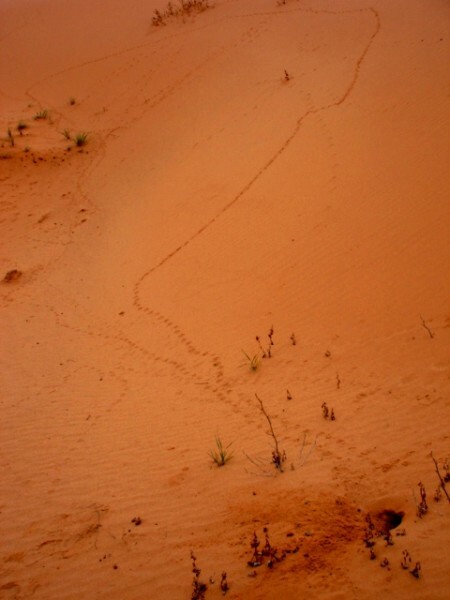 The tracks above the holes were of a fox - possibly a kit fox, which specializes in eating kangaroo rats. On a pedestal of the hardpan in a blowout a burrowing owl often perches. The larger blobs are pellets that the owl regurgitates, and the smaller whiter spots are its droppings. 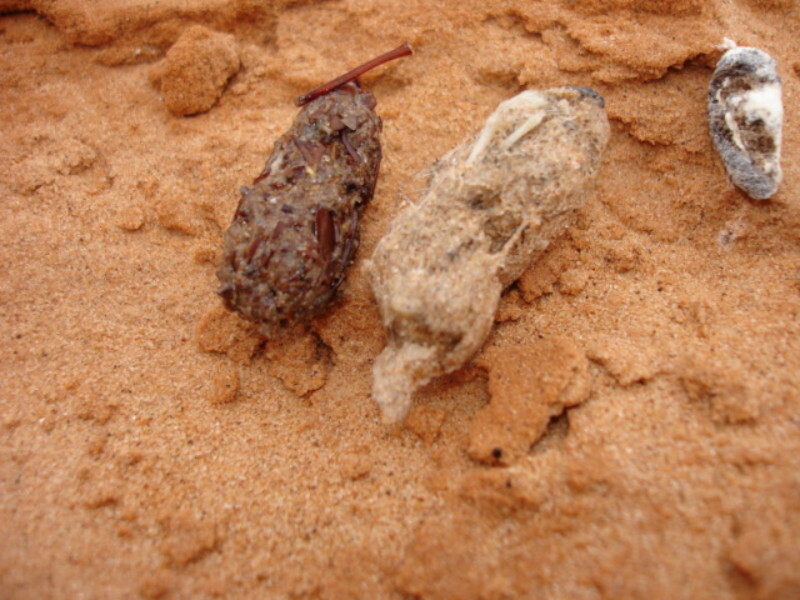 The pellet on the left has insect legs, while the one on the right has tiny translucent bird bones, and both have some mouse hair. 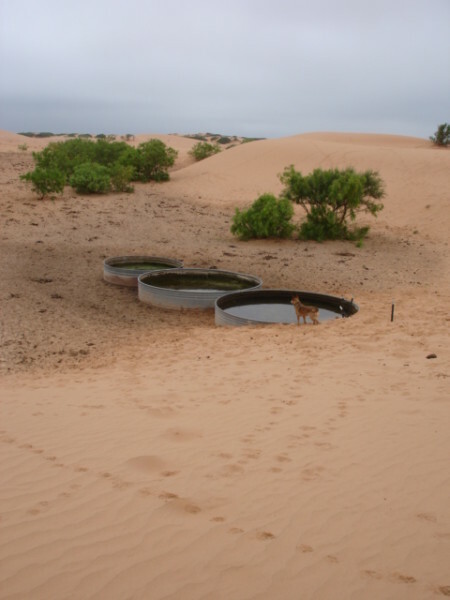 Sanddunes trap every drop of rainfall. In dune fields one can find groves of blackwillow. In wet years pools of water form between some dunes. 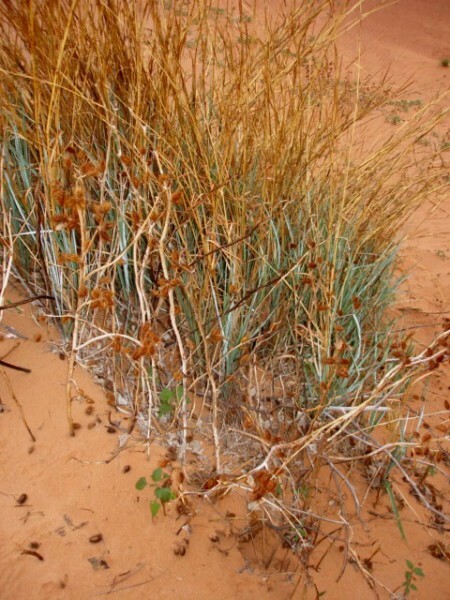 In recent years the European saltcedar has also begun to colonize the dunes. (The saltcedar has small pink blossoms in the foreground, and in the background are willows. The willows will send roots up to 100 feet from a trunk, and if the conditions are right, will send up new trunks along a long root. Years ago a rancher had a well dug near a grove of willows. Some of the willows are now dead. The windmill now longer works, but water is still brought to the surface, but by a solar powered pump. Three stocktanks were near the old windmill. Several mineral blocks were also nearby, as well as a handful of cows. In the water tiny gambusia fish swam - how did they get there? Some shinoaks take a tree form. These were 15 feet tall and had 6 inch diameter trunks. 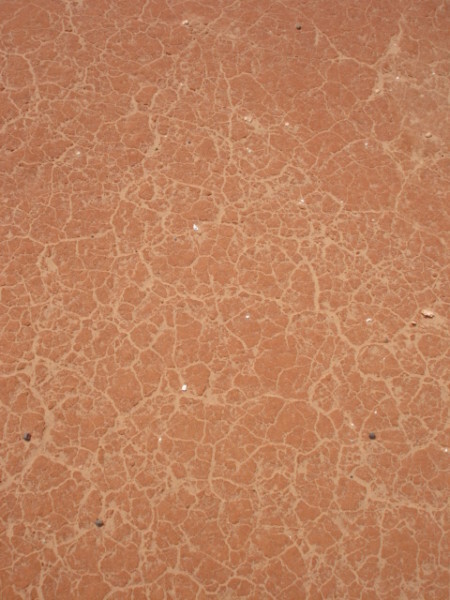 A close-up of the red hardpan shows an intricate cracking pattern. 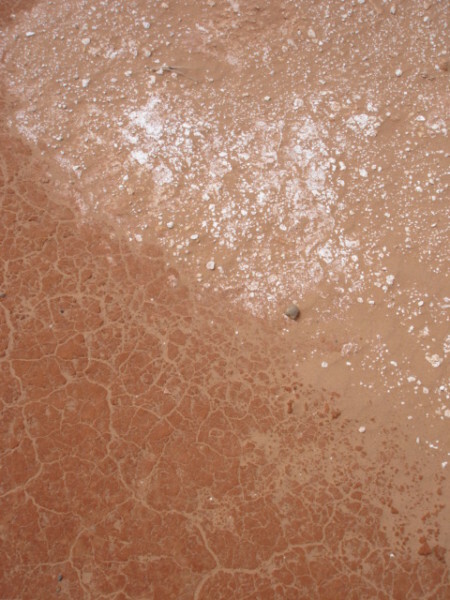 The white areas of the hardpan seem to be thin crusts less than an inch thick. 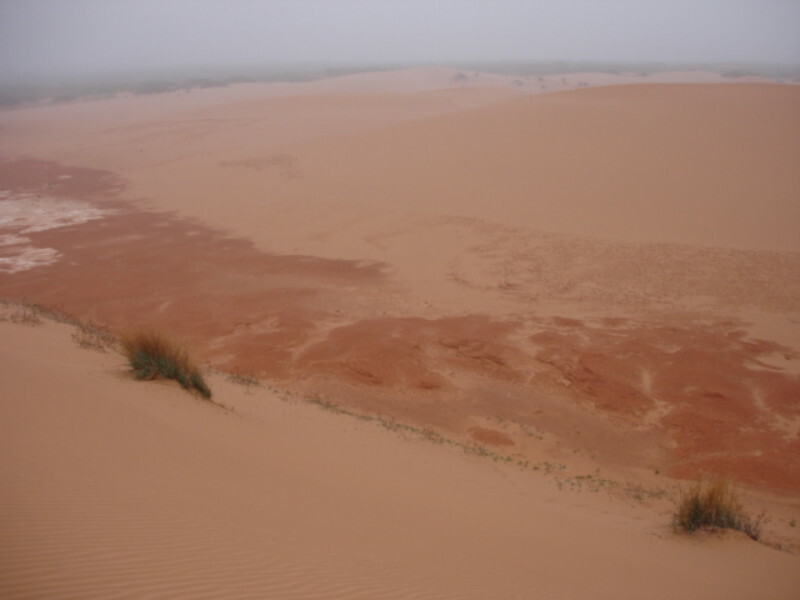 Did it originate as minerals in water pools between the dunes? 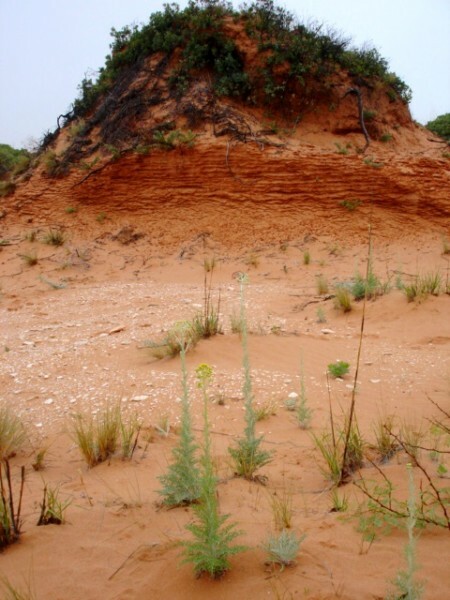 Or is it a caliche-layer formed underground? 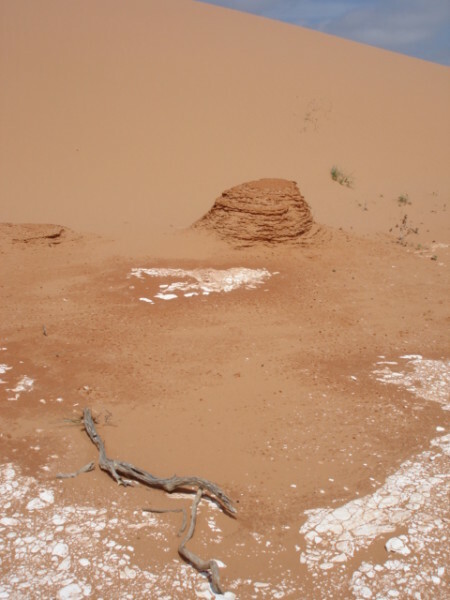 All three of the blowout features are shown here together - white and red hardpan, and a hardpan pedestal, along with one old shinoak root. When the clouds finally began to break apart, the clouds created a constantly shifting play of light and shadow on the dunes. Yucca can grow as fast as it is covered by blowing sand. When the sand blows away, the yucca root becomes a trunk. In the distance a broad vegetated swale with several grazing cattle reminds a visitor that this was once Clabe Merchant's great San Simon Ranch whose cattle wore the Hashknife brand. Was this old fence corner built in the late 1800s? Along one of the roads of the region was this well-maintained descanso. 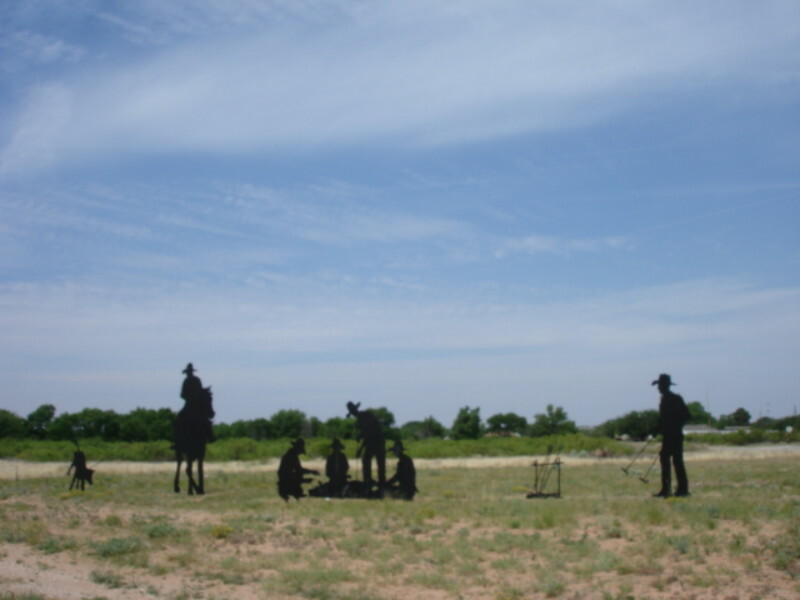 In the Jal City Park, Brian Norwood has erected this metal silhouette art of cowboys around a branding fire. North of town he has erected 30 foot tall cowboys and cattle depicting a cattle drive.